Is living on a boat for you? One of the best ways for novices to experience what is life is like afloat is to book a holiday cruise. Those considering ditching their bricks and mortar home and the stressful British housing market in favour of a life on board a boat are advised to try it out first. Hiring a vessel for a week or two week canal cruise is a great way to get some idea whether it really is the lifestyle for you. There are now a great number of dedicated companies offering boat hire throughout the UK and most can be easily found on the internet. A True Impression of Life Aboard? Although a canal boat holiday is certainly a great way to experience the highs of living afloat – lazily cruising through bucolic countryside, stopping to explore when the mood takes - it offers a much sketchier impression of the lows. Its account of everyday life afloat is as faithful as a long weekend break in Barcelona would be for the day-to-day reality of living and working in a foreign city. Two weeks of restful cruising in a state of the art boat basking in warm sunshine is no preparation for endless cold, wet winters cramped up in a poky little cabin, with few belongings, and faced with unpleasant chores like having to regularly change the water supply, and empty out the toilet. Still with British summers becoming ever more unreliable, you may at least get to experience what life is like in a narrowboat when the rain is lashing against the window panes! In fact some experts even advise undertaking a canal boat holiday during the winter time to see whether you are still as enthusiastic about living on a boat after a week of cold and damp in the gloomy British winter. This is certainly a cost-effective option because canal boat holidays are notoriously expensive, and the cheapest rates are usually found out of high season. A standard canal boat holiday will nonetheless give you an idea of some of the chief quirks associated with living on a narrowboat. For instance, are you the type of person who can adapt to living in such a restricted space? Are you happy working the many locks that interrupt your journeys around the network? After a week or two of living cheek by jowl with your family in a confined cabin, and having to bust a gut working the many locks en route, you’ll certainly have a clearer idea. Holidays present a valuable opportunity to get out amongst the waterway community and speak to experienced liveaboards along the way. Waterways folk are generally a friendly bunch and will be happy to share their boating experiences and offer any words of advice. Not only will a narrowboat holiday give you valuable insight into life afloat but it will also give you experience in handling such a large, unwieldy vessel. A complete beginner will usually be able to master the large craft with only the minimal pre-voyage demonstration and a couple of hours practice on the water. With far fewer controls, handling a boat is far less complicated than driving a car for example, and as there is a speed restriction of 4 miles per hour, everything happens at a much slower pace. 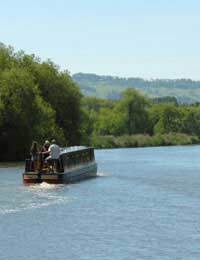 Canal boat hire firms will provide basic information not only on steering a boat, but also on operating locks and bridges, as well as highlighting the rules of the waterway and safety guidelines. Time and speed restrictions mean that it is impossible to make much headway through Britain’s thousands of miles of waterways. So if you are hiring a boat with the long-term aim of living on one then it might be worth using the holiday as a way of helping to determine which areas offer the best options in terms of setting a mooring base and local waterway exploration.